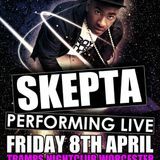 Live at Tramps Nightclub, Worcester. WR1 3QN. Room 1: Hip-Hop, R&apos;n&apos;B , Funky, Grime, Dancehall, Chart. Room 2: Dubstep, Bassline, Drum & Bass.